Ultra-Niche Crops are defined as exceptionally high-value crops that can provide a significant source of income to the farmer while using minimal land area. Winter lettuce is a crop that is seeded or transplanted in a high tunnel or other protected structure after the traditional planting season. Winter lettuce planting takes place from late summer through the fall, and lettuce is harvested during the cooler months. Many types of lettuce are suitable for winter production in high tunnels, including Butterhead, Romaine, and baby leaf types. It is important to understand the growth needs of a winter lettuce crop, such as temperature requirements, and soil moisture. 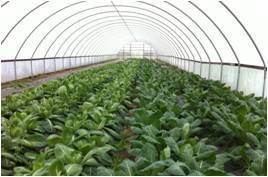 Producing winter lettuce in high tunnels provides a lower-input option to traditional heated greenhouse production. Growing winter lettuce in a high tunnel is a way to extend the season and increase revenue while maintaining your customer base through the winter months.